Fourth Row Center: Film Writings by Jason Bailey: On DVD: "The Secret Policeman Rocks!" On DVD: "The Secret Policeman Rocks!" Earlier this year, Shout Factory released the three-disc box set The Secret Policeman's Balls, collecting the performance films of the "first wave" of Amnesty International benefits organized by Monty Python's John Cleese. The first show, Pleasure at Her Majesty's, was performed in 1976 and comprised entirely of comedy sketches by Cleese and his Monty Python castmates, along with contemporaries like The Goodies and the cast of Beyond the Fringe. But the concerts gained their true identity in 1979, when the show was branded The Secret Policeman's Ball and, at the urging of co-producer Martin Lewis, musical performances were added to the mix. Those music performances, which were often stripped-down, acoustic versions of popular hits (in a forerunner to the "unplugged" format), became one of the primary attractions of Secret Policeman shows to come. Now, on the fortieth anniversary of that first music-infused show, Shout has followed up that extensive box set with the slimmer The Secret Policeman Rocks! , a "best-of" collection that compiles music performances from The Secret Policeman's Ball, The Secret Policeman's Other Ball, and The Secret Policeman's Third Ball, along with two from Amnesty International's Big 3-0, a 1991 show not included in the earlier box. The overwhelming majority of the songs collected here are from Other Ball, including the first number, Sting's solo performance of "Roxanne"; he accompanies himself on the guitar, and the resulting number is quiet, downbeat, and outstanding. Next up are former Yardbirds members (albeit at different times in that band's history) Jeff Beck and Eric Clapton, who turn in a raucous, jubilant performance of the blues grinder "Further Up The Road." Pete Townshend's acoustic cover of "Pinball Wizard" from the first 1979 show follows, and it remains a knock-out; it stands, along with the acoustic set on Elvis' 1968 comeback special, as one of the embryonic moments of the "unplugged" movement (a sidenote: as pointed out to me by Martin Lewis himself, both the version of the song on this disc and in the Shout box set restore a 30-second intro unseen in previous releases of the shows). Another unexpected spin on a modern standard follows, as Phil Collins performs "In The Air Tonight" as piano and guitar only (and without that iconic drum machine); it is a surprisingly powerful arrangement, well-performed. With those famous performances done, we now move into the middle section of the special, which has some good numbers, though (due to the arrangement of the performances) it feels rather like they're biding time until they can use another song by the marquee players that started the disc. Kate Bush's "Running Up That Hill" is solid, although it feels of its 80s period in a way that the other performances don't--particularly when butted up against Mark Knopfler and Chet Atkins' lovely instrumental cover of "Imagine." David Gilmour's rendition of "On The Turning Away" is pleasant if forgettable, though Dave Stewart's performance of "Amnesty" is stirring and Bob Geldof's performance of "I Don't Like Mondays" is strong. Next up is the return of Beck and Clapton, though their rendition of "Cause We've Ended As Lovers" sounds a bit too much like 80s power rock. The disc goes back on the upswing with Sting's second number, a mournful take on the uptempo Police hit "Message In A Bottle," again proving that that group's songs are as good, if not better, when stripped of their New Wave trappings. Pete Townshend's acoustic performance of "Won't Get Fooled Again" (with classical guitarist John Williams) is downright beautiful, while Peter Gabriel's powerful "Biko" is rather magnificent. The disc comes to a strong end with the Other Ball closer, an electrifying cover of The Band's "I Shall Be Released" performed by "The Secret Police," a super-group comprised of that show's participants (including Sting, Clapton, Beck, Collins, Geldof, Neil Innes, and Donovan). The Secret Policeman Rocks! has a much more affordable pricetag than the expansive Secret Policeman's Balls set, and for those more interested in the musical breaks than the copious amounts of Python-infused British comedy, it will surely do the trick. I personally prefer the box set--spotty though it may be, I prefer the music as counterpoint and accompaniment to the comic bits. 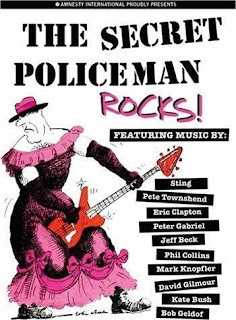 "The Secret Policeman Rocks!" is now available on DVD. On DVD: "Not Quite Hollywood"